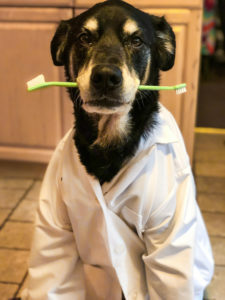 Scooby wants to remind you that February is Dental Health Month! Schedule a dental cleaning with us and your pet will receive complimentary full-mouth digital dental radiographs and a fluoride treatment. Giving your pet a clean, healthy mouth will make you want to smooch your pooch and kiss your cat more often! Give us a call to schedule to schedule an appointment for your pet: (609) 926-5300. Routine dental care in pets is very similar to dental care in humans. It includes yearly check-ups, daily brushing, and regular professional dental cleanings. When plaque and tartar accumulates in the mouth, bacteria gets trapped. The result is infection of the teeth and gums, bad breath, and gingivitis (inflammation of the gums). Inflammation from dental disease may affect the heart and kidneys as well. Pets are often good at disguising their discomfort and it may be difficult to notice when they are feeling pain in their mouths. Sometimes, they will continue to eat, drink, and play normally. One indication of dental disease is bad breath. You veterinarian can help identify other signs before they lead to pain and tooth loss. Our dental services include preventive oral home care, full mouth dental x-rays, ultrasonic teeth cleaning and polishing, and oral surgery to remove damaged and infected teeth. Overwhelmed at the idea of brushing your pet’s teeth at home? Don’t be. We have tips to help you with this important task! For guidance on brushing, or for a customized home-care program, give us a call at (609) 926-5300. If this is your first visit, speed up the check-in process by filling out your form online. It’s easy! count on us for expert care. Let us know how your visit went.